Did Jules Verne influence “Dracula”? 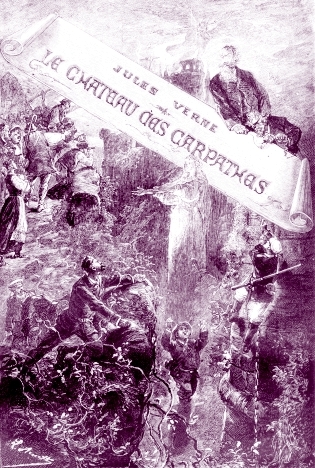 Despite all the research I did on Dracula while writing my book The Gothic Wanderer, I never came across mention of Jules Verne’s 1893 novel Carpathian Castle, originally published in French as Le Château des Carpathes. Consequently, when I recently came across mention of this novel and the assertion that it may have been a source for Stoker’s novel, I was eager to read it and see whether the theory was plausible, especially since I found no further statements to back up the assertion that The Carpathian Castle may have been a source. An early cover of Jules Verne’s Carpathian Castle. My final assessment is that Stoker probably never read the book or was familiar with it before writing Dracula. I admit I haven’t been able to locate when the book was translated into English, or whether Stoker could read French, but regardless, there are no passages in the novel that remotely appear to be similar to anything in Dracula. The only possibility is that Stoker could have decided to set his own novel in the Carpathian mountains after reading this book, but there is no other similarity. Yes, the book makes some references to supernatural creatures whom the locals fear, including vampires, fairies, and family ghosts, but there are no supernatural characters in the entire book; nor does the castle in any way resemble the castle in Dracula, and there is a total lack of pacing or narrative similarity between the two works. There are no multiple narrators as in Dracula—a technique that Stoker most likely took from Wilkie Collins’ The Woman in White actually, a book Stoker greatly admired—and in short, The Carpathian Castle is downright boring. The premise of The Carpathian Castle is fine enough, but I’ve found that Verne is often hit or miss in his books, at least for today’s reader. The only two of his books I actually enjoyed reading were A Journey to the Center of the Earth and Michael Strogoff. Other books I have found to be extremely slow-moving, including Twenty Thousand Leagues Under the Sea, The Mysterious Island, and Robur the Conqueror, but The Carpathian Castle has to be the slowest since almost nothing happens throughout the entire book. The climax is also disappointing, although of course, it would have been more thrilling to Verne’s contemporaries, but we have seen the kind of thing Verne pulls off here so many times today that it seems old hat, although with all respect, Verne was a pioneer of his genre. The castle near the village of Werst is believed to be abandoned until a Jewish peddler sells a telescope to a local farmer, who then is able to view smoke rising from the castle. This discovery results in two people trying to reach the castle, only to have calamity befall them, which is easily explained but makes them think it is supernatural. Then Count Franz de Télek passes through the town and hears the stories, including that the castle belongs to Baron Rodolphe de Gortz, who disappeared years ago and is believed dead. However, the count has seen the baron since his disappearance, and together, they were rivals for the affections of the beautiful Italian prima donna La Stilla. Ultimately, La Stilla died and the baron blamed the count for her death. The count decides to investigate, only to discover he can hear La Stilla singing in the castle, and then he sees her image. The end is predictable when it’s discovered her voice is a recording and he is viewing a holographic image. Since the novel takes place in the late nineteenth century, these new inventions would have been surprising to Verne’s readers, but after we have seen plenty of illusions, notably the wizard’s various appearances in The Wonderful Wizard of Oz (and I doubt L. Frank Baum read The Carpathian Castle either), such discoveries are no longer surprising to modern readers. Verne’s story follows the Gothic subgenre of rational explanations for supernatural events that goes back to Ann Radcliffe’s novels a century earlier. However, he does seem to draw on some supernatural elements of Gothic novels, notably the Wandering Jew theme. It is notable that it is a Jewish peddler (a Wandering Jew figure) who sells the telescope through which the castle is discovered to be inhabited. This Jew is also describes as selling time and the weather (barometers and thermometers, and the footnote states “temps” in French is an untranslatable pun to mean “time and weather”). While these items are physical objects, they are in line with the Wandering Jew’s alleged ability to control the elements—Dracula himself, a literary descendant of the Wandering Jew, also has power over the elements in his ability to create a storm or mists when he arrives in England. That said, this character disappears from the book after the first incident so Stoker does not take the metaphor further. The local innkeeper is also Jewish, but we are told he is not usurious like most Jews who are buying up Transylvania so that someday perhaps it will end up being the Promised Land for them (of course, Verne is writing decades before the state of Israel was established). There really is no point in this character being Jewish at all. There’s really nothing else of interest in The Carpathian Castle. My copy (Ace Books, 1963) is 190 pages and it takes forever in it for the characters just to get to the castle. The story could have been half as long with what little plot there is. If Stoker read The Carpathian Castle, perhaps the only influence it had was that he figured he could write a better novel; he wouldn’t be the first author to read a poor novel and be inspired to write a better one as a result, but unless some evidence appears, I think it’s safe to say that Dracula owes no debt to Verne’s novel.